Yes sir, Yaesu sure knows how to make excellent transceivers. 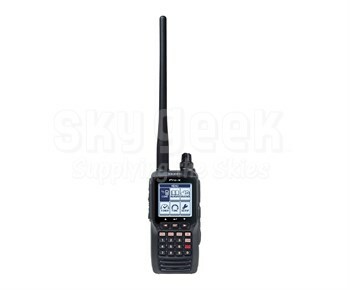 Their FTA-550 Handheld VHF Transceiver is simply a continuation of their commitment to excellence. We always wondered what FTA stands for; we were thinking �Fantastic Transceivers Association," but we are unsure. We might have to call someone to get an answer. To get a clear answer we could use the FTA-550 itself. The menu is easy to operate. Configure with the help of an icon driven system. Enjoy an intuitive and thus more user-friendly interface. Receiving a VOR signal, the FTA-550's display will automatically switch to the NAV band screen which shows a CDI (Course Deviation Indicator) based on the received signal. This transceiver can store up to 200 memory channels. Name them using up to 15 alphanumeric characters per name for quicker retrieval. Easy to Operate Menu system: The FTA-550 comes configured with an easy to operate icon driven menu system. The displays and menu settings are logically configured for a more intuitive user interface. Huge Dot Matrix Display (160 x 160 dots): The FTA-550 features a huge 1.7" x 1.7" full dot matrix LCD display with full backlight and dimmer. The high resolution display makes it easier to view all the great features the FTA-550 has to offer. VOR Navigation Display: When the FTA-550 receives a VOR signal, the display will automatically switch to the NAV band screen which shows a CDI based on the received signal. 200 Memory channels with up to 15 Alphanumeric characters: The FTA-550 can store up to 200 Memory channels for quick and easy retrieval. With the capability of using up to 15 Alphanumeric characters per name the FTA-550 allows for a better channel description.